When you own an aquarium, at some point you will need to filter the water as a way of cleaning it and removing harmful dirt and debris. Which filter would be the best for the aquarium? Canister filters have grown in popularity, and a greater number of people than ever before are now using them. This is because the best canister filters come with superior mechanical, chemical, and biological filtration capabilities. These filters can be used for saltwater tanks, freshwater tanks, for reef tanks, or even for turtle tanks – and they will just work fine in all of them. This impressive compatibility is what makes the canister filters highly appreciated by many people. Whenever you compare the canister filters to other types of filters, it is easy to see that they have better flow rates. Some can even go up to 320 gallons per hour. This means that the whole filtration process for your aquarium should take less time, which saves you time and energy. If you are going to get one, just make sure that you check out various models to understand their flow rates before making your choice. The canister filters often come with many types of filtration media you can select from, but you need to know how such media works before making your purchase. Read a number of reviews on each type of media to see if it has always served to meet the owners’ expectations. You can also check on the amount of maintenance needed for the media before selecting it for your tanks. You do not want to end up with a filter you have to take for maintenance every few cycles. Setting up a canister is seen to be the easiest, compared to the process of setting up other types of filters. It is always important that you follow the instructions as given by the manufacturer, just to make sure the setup procedure is completed correctly. Cleaning canister filters is easy when you have the right manual and all the right tools. Most of them are designed to be disassembled easily so that you can access the internal components for cleaning. The manufacturer manuals are easy to read so that you can clearly understand how to perform the maintenance. Once the filter is cleaned, you can now put the components back together and mount it again, ready to thoroughly filter your tank crystal clean again. Everyone with an aquarium is in search of a filter that does not produce a lot of noise when operating. The best way to avoid noise and vibrations is by using a canister filter. These filters have been tested by a range of users and the customers always come back online to talk about their experience. Most would agree that they had a pleasant time having a nap in a room with a canister filter on. The whole idea of filtering your fish tank water is to remove unwanted components from the water. This includes debris, among other things, introduced into the water over a couple of days or weeks. Running your canister filter should easily catch the debris and prevent it from going back into the fish tank. This means that your marine life will have the clean environment necessary for survival. You should clean the filter often to ensure that it keeps working to separate the debris from the fish tank water. Penn Plax has the reputation of offering heavy duty canister filters and this one is not any different. With this model, you get a multi-stage filter, which means that all the dirt is removed in every possible way. In the end, your fish will enjoy a sparkling clean environment thanks to the filtration capability of this filter. It is made to be multipurpose, so you can use it for either saltwater or freshwater aquariums. This means that it can be perfect for goldfish who would love a clean environment. When it comes to capacity, it boasts of handling more water than many of its competitors, and can even be used for 200-gallon tanks. When it comes to installation, it should be very easy. The manufacturer provides you with all the necessary parts so that you do not have to spend any extra money to install the filter on your tank. You get flow rate control valves, which are all important to prevent any leaks while doing maintenance. The large filter trays used on this model will last a long time before there will be any need to think about replacing them. Changing the media should not be hard, as it comes with an easy-lift clamp that gives access to the filtration media and other parts that require maintenance. This new model is notable among the canister filters for having amazing features users will love. This model comes with superior filtration abilities that make it suitable for all types of aquariums. You can use it with both freshwater and saltwater aquariums and it will be equally effective with either. The advanced motor makes sure that there is a strong flow rate maintained in the aquarium even during the maintenance. You might have experienced other filters making noise during the filtration process. This one is engineered to minimize the vibrations and the overall noise produced when in operation. This makes it suitable for saltwater, freshwater, reef, and discus fish tanks, as the fish often do not like the vibrations. The multistage filtration process is important for this model, as it ensures that there is minimum maintenance is needed and maximum versatility supplied. The filtration stages include the mechanical stage, chemical stage, and biological stage. 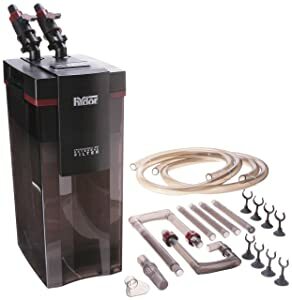 The manufacturer has equipped this model with aquastop valves that will stop the water from flowing without even needing to disconnect the hoses; this should eliminate any leaks and overall maintenance mess. Due to its design, you can use this filter with up to 100-gallon tanks with ease. This newly designed canister filter is created to provide quick support and quick, spill-free setup. Its great features make both marine and freshwater aquarium success quick and simple. Multistage filtration guarantees a healthy and clean aquatic condition by means of mechanical, biological and chemical filtration. 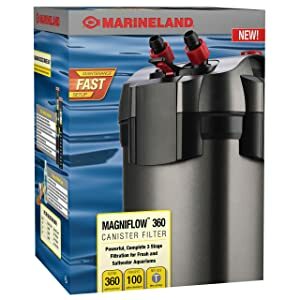 The Magniflow canister filter is stacked with unique, user-friendly components to make keeping up your aquarium more effortless than ever before. It comes with a lid that creates a water-tight seal when compressed and lifts up for simple expulsion. The Stack n’ Flow filter plate permits various media layers for complete mechanical, biological and chemical filtration, and is simple to take off to change or clean the media. 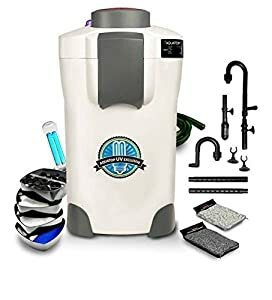 A fast-prime button loads the filter chamber with water for quick, self-priming setup, and a specially-designed valve lets you instantly close down the flow of water and separate the cover from the engine housing for easy, spill-free upkeep. 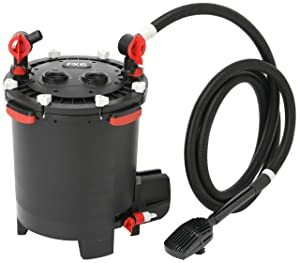 The advanced components on this newly made filter give you the tools you need to create a spotless, healthy aquatic condition with considerably less exertion. Hydor Professional Canister filter might be a new name in the industry of canister filters, but it sure knows how to make people talk about it. This starts with how it is built. This model is made with a strong and sturdy construction so that it can serve you for longer. You will not get even the slightest impression that it is made from a cheap plastic. The base has four rubber feet to give it the best stability you can get in a canister filter. Setting it up should be a real breeze, even for those who might not have used a canister filter before. You should be done setting up the filter within just thirty minutes. Make sure to refer to the manual for instructions about how all the connections fit together-that will make it easy. The capacity is just amazing, as these models can handle a lot of water. There are a variety of models to choose from, and the largest you can get is for a 40-gallon to 150-gallon tank. The filter works just as well on the smaller tanks. The noise level of the filter is quite low so that the marine life is not disturbed. With such quiet operation, this model is great for aquatic turtles, reef tanks, and saltwater and freshwater tanks. 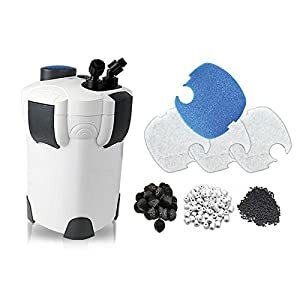 As expected, this is an amazing canister filter, as it comes from a reputable company. To start us off, it comes with the high capacity needed to handle more filtration and still maintain its compact size. As compared to other models, this one is often considered to be great for tanks ranging from 250 gallons to 400 gallons. Not many filters can boast of being able to handle such amounts. This model is also equipped with a number of technological features that make it exceptionally efficient. One worth mentioning is the self-priming start system that prepares the canister for the filtration process as soon as you hook it up. The intake strainer is made to be clog-proof so that it can be effective for longer. You will not have to worry about the debris getting past it, which would impede water flow in a planted aquarium. The aquastop valves on this model make your maintenance a lot easier, even for tropical aquariums. The work of the valves is to separate the housing from the filter in a single step. This will eliminate leaks and make maintenance simpler for the user. The CF series is among the most popular canisters on the market today, because it comes with a feature none of the others have—a UV sterilizer. Some people may be skeptical as to whether the UV sterilizer works or if it is just a marketing gimmick to get people to buy the product. Starting with its construction, you get a solid filter with this model, even though it has many plastic parts, which many people might consider unattractive. The work of the UV sterilizer is to eliminate microorganisms such as algae, bacteria, and other parasites found in the water and sand substrate of your tank. If you have installed a canister filter before, you will find setup for this one to be pretty easy. For new users, you might have to work a little harder, as the manual is not as clear as it should be. With a flow rate of about 370 GPH, you can be sure this filter is a good one that will benefit the environment for your fish. The capacity, on the other hand, is less outstanding but still within a respectable range. You can use this model for tanks up to 175 gallons. It is actually true that a performance-tailored model is the thing that most aqua-aficionados search for when looking for a durable and high-quality canister filter. The Pro Canister Filter by SunSun, which compares very favorably to other canister models, is an excellent filter that can be used together with others to provide additional filtration ability and the cleanest possible aquarium water. It works superbly and also helps the main filter to last for a longer period as it takes on the majority of the workload. The SunSun canister filter can take a solid flow of extremely pressurized water, so the keeper of the fish can choose the flow rate they require. The SunSun canister filter is designed with a priming button. You need only to press the button to fill the tank with water. After that, connect it and the filter starts pumping promptly. This priming feature wipes out the need for siphon priming. The fourth phase of this canister filter is a bright, built-in nine-watt ultraviolet light. The ultraviolet light eliminates any suspended algae that manage to pass through the canister filter. When algae cells are exposed to UV light, they will instantly be killed. This will diminish the odds of an algae sprout and keep your aquarium crystal clean and clear. The UV light element likewise lessens the population of parasites and pathogenic bacteria that cause fish diseases. This sterilization ability of UV light is diminished when the water is unclean. The dirt particles obstruct the UV beams from striking the microorganisms and decreasing their viability. The SunSun Four-Phase includes the UV light as the last phase of filtration, guaranteeing that only clean water is exposed to the ultraviolet light. The canister includes spray bar, suction cups, and long hoses. This canister filter is recommended as a quality filtration reinforcement to improve the care of your aquariums. The Eheim Classic canister filters are among the most-used external filters on the market today. They come with various features that meet the needs of many of the people who are looking to use them. This model comes with a very solid build that assures you of its durability. You will not have to buy a new filter after a few months. In the place of plastic clamps, Eheim uses small stainless steel clips that lock the motor head to the canister. Without a doubt, they will easily keep the motor in place for the life of the filter. When it comes to the setup process, you might have to struggle a bit with the diagrams in the manual, but the process itself is easy. The manufacturer has made this model energy efficient so that you do not have to worry about the overall power consumption. With its impressive flow rate, this canister filter has been rated the best for goldfish tanks. Depending on the model that you choose, it will work efficiently for 40-gallon, 66-gallon, and 92-gallon tanks… even up to 300-gallon tanks. With very low noise levels, the filter has expanded its viability to accommodate various types of marine life. The purpose is quite important to keep in mind when choosing a canister filter. This simply means you have to keep in mind the filter’s capabilities and your filtration needs. Ask yourself questions such as whether or not the canister will be able to handle the volume, flow, and versatility you require, among other needs. It would be best to get a canister filter that has a higher flow rate so that the filtration process does not take a long time to complete. It is important to keep in mind where the canister filter will be located. For those who have a stand for your aquarium, you can simply conceal it in one of the cabinets compartments. For a tall filter, you might have to look at other ways to keep it hidden or to make it complement the fish tank. When it comes to durability, look for a filter that is well built so that it can guarantee good long-term service. Most will be made of plastic, so just make sure it is a strong plastic for longer life. The motors are important for helping to pump the water into the filter to start the filtration process. It is easy to see that you will need a great motor that can easily help in pumping the water. The motor also needs to be reliable in terms of efficiency and maintenance. Some motors might need more maintenance than others. Having a high maintenance filter might mean that you will need to open up the unit more often. That is not always a good thing for a canister filter. The motor will also determine whether the model can operate quietly or will be making a lot of noise when it’s turned on. Not all the canister filters will be ideal for the various tank sizes. The tank size is still an important factor to consider when shopping for the best canister filter. You have to read the product description and understand the size of tank it can easily filter. In most cases, they would be rated 10-gallon, 20-gallon, 29-gallon, 55-gallon and even more. If this information is missing, you might have to contact the customer support team to help out. This will give you the information you need regarding which tanks will get filtered best with which model of canister filter. Without a doubt, the brand name often plays an important role when it comes to buying a canister filter for either a small tank or large tank. The brands reviewed in this buying guide are all good at what they do. You can always be sure that the products delivered will work as advertised. If you opt for other brands, make sure to do a little bit of research to see how well their products work. Some manufacturers will claim to offer the best products only to leave their customers disappointed. It is common for each person to have a set budget that he is willing to spend on a canister filter. The best budget canister filter to buy should be based on a number of things and not just your ability to afford it. It is important for you to take the time to check out different prices and filters before settling on a budget. You may be surprised, when you compare different options, by just how much you can get for the price. Online stores are a great place to start if you are looking to quickly and easily check out a variety of canister filters available on the market. The question of how a canister filter works is a common one many people wish to ask. This is important so that they can know how best to utilize them, and also for maintenance too. You are likely to encounter many types of canisters when you are reviewing your options, some with a UV sterilizer and others with canister filter media. Understanding how both types work is beneficial to the user making a choice of what to purchase. You might have noticed that canister filters are mounted on the exterior of the tank, with one piece inside the aquarium depending on how it works. It will have inlet and outlet fittings which will allow for the water to flow in and out of your filter. These tubes are adjustable so that they can be fitted easily to the filter and back to the tank. These filters will have an in-tank pump, which is vital for propelling the water into the canister for filtration. Other models might have mounted motors and will rely on gravity to start the system. Once the canister filter is filled with water, the internal pump will then force the water out of the filter back into the tank. This whole time, the water will pass through the various filtration layers inside the canister. The membranes will trap all the debris and other microorganisms, allowing only clean water to go back to the tank. As you can see, a canister filter requires regular maintenance. This maintenance process is often straightforward, as you simply need to disconnect the valves and open the unit. You can clean the internal components based on the directions given by the manufacturer. You should also use the instructions from the manual to put the components back in place before mounting the canister filter back in its position on your tank. 1. What is the best canister filter for saltwater aquariums? All of the most canister filters we have reviewed above come with impressive features which make them great for both saltwater and freshwater aquariums. You simply need to review their sizes, features and decide which works best for your aquarium’s needs. 2. What is the best canister filter for freshwater aquariums? 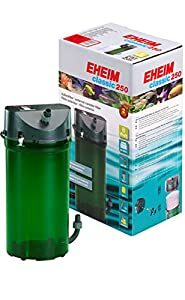 Although there are many that can be used in freshwater aquariums, in this case, the EHEIM classic canister filter or the Penn Plax models are excellent choices. They often come with a high capacity that will handle the large tanks that you wish to have filtered in less time. 3. How to prime a canister filter? You might find that most of the canister filters come with the directions on how to do this, but still you can use one common trick from us. Once you have assembled it, submerge the filter in the tank, then plug it in. Tilt the canister to the side to submerge the impeller and start the suction. You can hold it in this position for a minute and then tilt it upward to expunge the air. It should be primed now. 4. How to set up the canister filter for aquarium? You need to make sure that all the parts are well assembled first, before mounting the canister filter in its position. You can now connect the inflow and outflow pipes and connect the filter to your tank based on the canister instructions. Place it in its permanent place to ensure that it doesn’t need to be disturbed later. 5. What’s the best canister filter for a fish tank? Different models will come with all sorts of features; you simply need to choose a model with features that will work best for your fish tank. 6. How often is it necessary to clean canister filter? The maintenance of the canister filter will vary from one manufacturer to another and also based on how often the filter is used. Ideally, you should clean it every three months for greatest effectiveness. 7. Where to put purigen in canister filter? It is advisable to place the purigen where the water exits or you can still place it before it the water goes to the ceramic rings. 8. How much does it cost to run a canister filter? It does not cost much as it is common for these filters come with small motors that do not take up a lot of energy. 9. How to get air out of a canister filter? You should make sure that all the joining parts are properly sealed. The air is mostly because there is a leak and it is sucking in air. With proper sealing, you should prevent the air bubbles from happening in future. 10. How to layer media in canister filter? You first have to make sure you have the right layer media for your canister. The general layering starts from back to front with ceramic rings starting, coarse sponge next, bio media follows and at the top you have the filter wool pad. By now, if you had no idea why your aquarium needed filters, then it is clear you have to get one today. With so many options available, you might be even confused about which one to choose. 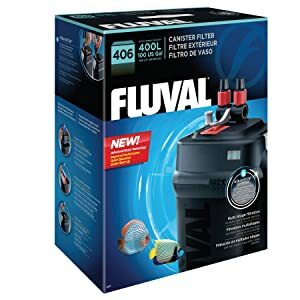 The best choice canister filter review shows that the Fluval FX6 Canister filter would be the best option, as it comes with many desirable features. You get a self-starting feature, it’s easy to mount, and it’s energy efficient, among many others. There is no problem if you decide to go for a different model, just make sure you keep in mind the considerations of picking the right model. Where did you get your bio filter material. In the canister video? wow,this is what i was looking for,let me sign up using the links you provided to buy the best filter you have reviewed. I can’t seem to get any suction throughout the hoses. What could be wrong? I didn´t know about how to set up an external filter, now I know! Thank you very much. How does the API XP3 canister filter rate? What’s the name of the grey color Bio Media? Were can I get the bio material in the video? in MI USA?